What is the best city in America for small business growth? According to a newly-released survey from Biz2Credit, it’s San Jose, Calif., which edged out New York City to achieve the number one ranking. 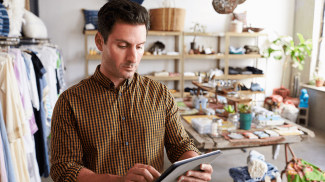 Biz2Credit, an online marketplace for small business funding, analyzed more than 55,000 businesses across the country in its annual Best Small Business Cities in America survey. 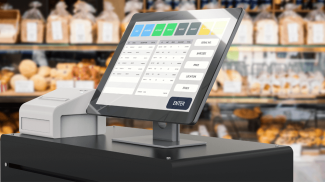 To qualify for inclusion, businesses had to have fewer than 250 employees, less than $10 million in annual revenues and have been in operation for more than one year. 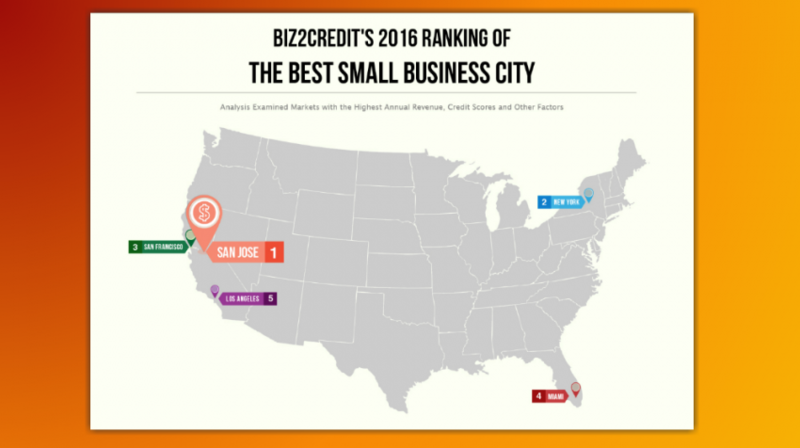 To determine the top cities for small business growth, Biz2Credit uses a weighted average that includes annual revenue, credit score, the age of business (in months), cash flow, debt-to-income ratio and the business owner’s personal credit scores. The site crowned San Jose with the envious title of Best Small Business City in America because it scored in the top five in average credit score, average annual revenue, and Biz2Credit’s proprietary BizAnalyzer score, which takes into account local economic factors, such as operational costs and tax rates. Arora cited San Joses’ GDP growth as another factor. “At 6.2 percent, its GDP growth far outpaces the national GDP growth of 2.4 percent,” Arora said. Although New York City led other cities in average annual revenue, it finished second due to the high cost of doing business, according to Arora. Other cities finishing in the top five include San Francisco, Miami and Los Angeles. Arora sees Miami holding a unique opportunity for growth, thanks to the burgeoning relationship between the United States and its neighbor to the south, Cuba. Philadelphia ranked first based on the category Age of Business (in months), followed by Memphis, Tenn., Riverside-San Bernadino, Calif., Orlando, Fla. and Charlotte, N.C.
Indianapolis, Ind., San Antonio, Phoenix, Denver and Detroit rounded out the top ten. 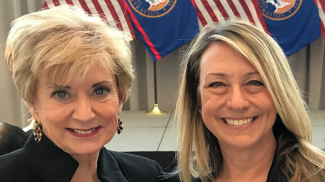 Of interest, Biz2Credit looked at 500 companies in Philadelphia that applied for loans and found that nearly 70 percent (336) came from start-up companies — a percentage much higher than any other city on the list. 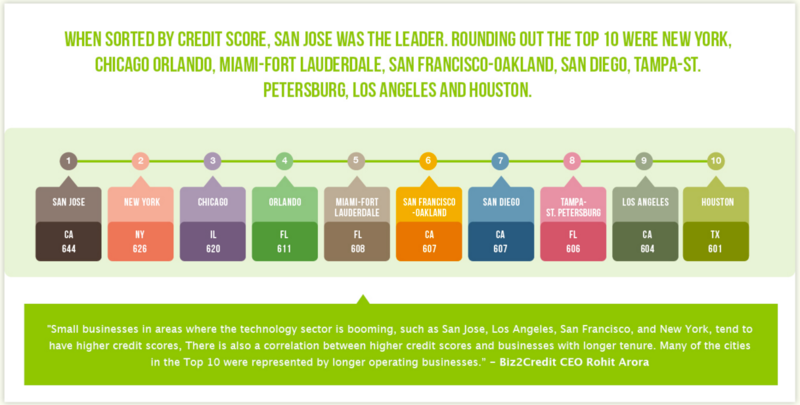 San Jose was first on the list when sorted by Credit Score, followed by New York, Chicago, Orlando, Fla., Miami-Fort Lauderdale, San Francisco-Oakland, San Diego, Tampa-St. Petersburg, Fla., Los Angeles and Houston. View an infographic showing the survey results. Focusing on revenue predisposes the list toward more affluent/expensive areas. Are there any less subjective measures that would be more representative of small to mid-size cities? Not in this particular study, or so it appears. Robert, you may want to search the site for other studies that highlight small, less affluent cities. Paul: Yes, I would be interested in smaller cities on the march too. Have you read the book Life 2.0?